Still half-asleep, I woke up at 4 a.m. to hit the highway for a four-hour drive. I had retired from “moving weight” (selling drugs) to moving words—ones of experience and inspiration. I was headed back to prison. I had a conversation with my mom the night before about me going “back to prison.” After her initial gasp, she hit me with the Haitian-mom "umpf," showing her concern and doubt, punctuated by "m ap priye pou ou." I told her I'm praying for me too. 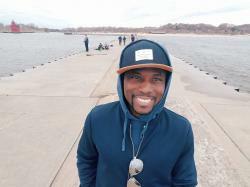 As a formerly incarcerated inmate turned postdoctoral scientist at Johns Hopkins Medicine, I had come full circle—From Prison Cells to PhD—and now back to prison to deliver a motivational speech to inmates on the importance of education after release. Obtaining higher education reduces the rate of going back to prison from roughly 70 percent to nearly zero percent (1). I could not even begin to explain my feelings. I was excited but torn, eager yet uncertain, happy and sad. It’s impossible to capture the emotions. Overall, I was inspired and honored to have the opportunity. When I entered the prison gates and heard the loud clang of the solid iron door slamming closed behind me, I knew there was no turning back. I was politely greeted by the warden, two assistant wardens and three correctional officers. The warden was an attractive young white lady (maybe 40 years old), wearing a very professional navy suit. She was not what I expected the warden of one of the largest high-security prisons in Illinois to look like. In all my years locked up, I had never met a warden. About 70 percent of prisoners in the United States are people of color. As I walked the prison yard, a black man in civilian clothes with two older white men in suits, three white men in uniform, and the head of the prison, all eyes were on me. 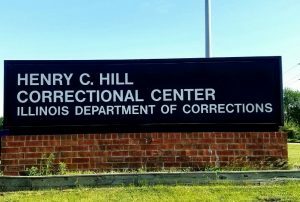 Hill Correctional Center is one of the largest high-security level prisons in the state of Illinois. I arrived at the activity center and was escorted through more locked doors and past more inquisitive faces. I saw a packed room of roughly 200 inmates. I spoke for 2 straight hours and had more attentive faces than any college auditorium lecture I had ever delivered. The room was full of tattooed tears and bodies fully covered in art. It was a room bursting with potential, of listeners deeply eager for a second chance. It was truly inspirational. I took a tour of the grounds. The air in the yard felt like prison, despite being the same rural country air separated by 20 feet of triple-barbed wire chain fences. There are about 1900 inmates and 10 housing units or dorms. Unlike most visitors, I was permitted to walk through one of the housing units. I saw the cells. I saw the faces I remembered like yesterday. I visited the segregation wing and even hung out in the wardens’ office talking Illinois politics. The entire day was surreal. Even as I have progressed past the prison cell to the lab, my home state of Missouri stated that they still consider me a non-rehabilitated criminal—a difference in politics I guess. Through visits like these, I hope to shine a light on the powerful role of education. Nationally, 43 percent of formerly incarcerated individuals are likely to return to prison within three years of release (65 to 70 percent within 5 years). 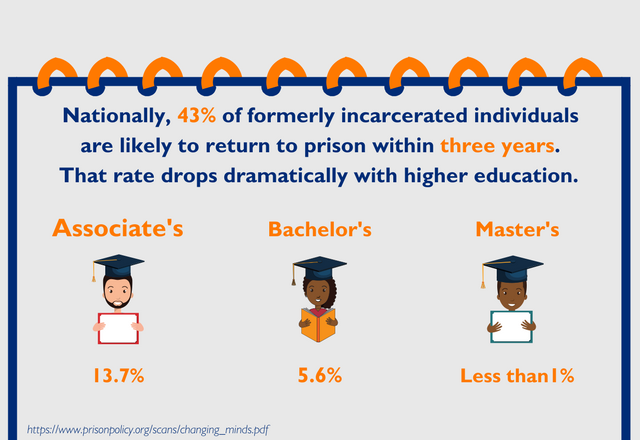 However, the recidivism rate drops dramatically with access to higher education (1). In fact, the rates drop to 14 percent for those who achieve an associate’s degree, 6 percent for those who get a bachelor’s degree and less than 1 percent for those who get a master’s degree. My goal is to inspire others with similar backgrounds as myself to excel beyond what society and life circumstances have set to be the norm. Thank you to Correctional Officer Justin Bryant and Warden Stephanie Dorethy for the invitation. I must also thank my Hopkins mentor, Dr. Sheng Wu, for respecting my mission. I also want to express my love to my wife and family for supporting me on this mission. It has not been easy to share this part of me. Prison Education Reduces Recidivism by Over 40 Percent. Why Aren’t We Funding More of It? 20 Comments on "Spreading Hope to Those Deemed Hopeless"
Such a powerful message! Thank you. You are an inspiration! Great read. Dr. Stanley Andrisse, I was convicted on conspiracy to distribute cocaine and did 10 years also in Federal prison. As you stated, it is very hard to talk to anyone about it as they just don't understand and have never been there. Three years after my release I decided to further my education and now attend the local Community College through a federal government program. This is the best decision I feel I have made in years. I work part time and attend school full time. I read your testimony and am proud of you for being an inspiration to others. It had to be hard to walk back through those prison gates. Keep up the good work and good luck to you and your family. May God bless you also. Respect to those who made that 'choice', followed through and are still progressing. Those who have open ears=open minds, it isn't easy,but it can be done. So inspiring - brought tears to my eyes. I hope it is okay to share your message - it is exciting, full of hope, and such a joy to read. I will be praying for you and your work. Remarkable! What a gifted guy! Thank you for sharing your story. So many people of all race to read your message. Keep on your journey of recovery and success. Praying for you. You are an inspiration and wonderful example for all to follow. Thank you for sharing your story. So many people of all race to need to read your message. Keep on your journey of recovery and success. Praying for you. You are an inspiration and wonderful example for all to follow. I am grateful for your inner strength that has allowed you to share your story and inspire others. Thank you for taking this leap of faith to share your story with the world. Even if the direction of only one person's life is altered because of your gift, it will have been worth it. Well, well, Dr. Andrisse, a job well done, I applaud you!!!! And thank you Momma for those endless hours of prayer you showered your son with. God had a divine purpose and allowed you to wonder and go your way for you to learn that you were nothing without him, but look what happened when you turned to him. Hopkins is a great place and if you put your nose to the grind, as you obviously have, ALL things are possible. You continue to return to those roots, don't be ashamed of them any longer, for they had a purpose and you can reach and change so many, but remember you have been inspired and lead, to plant the seeds,....but you may not be the harvester of them. Someone else may have that responsibility later when they are ready, so don't ever be discouraged by lack of immediate results. God's speed to you and your family and may you never run out of energy to do all that you dream or are called to do! This story is so inspirational. I am proud of you young man. I am also proud of Hopkins ( I work here) for giving you the opportunity to become "who you are today". There are many more out there who think all is lost because of poor choices, but you as an example have given them hope. Thank You! God Bless! This is such a powerful and motivational story. You have and will inspire others with your story. I work at Johns Hopkins and it is indeed a great place to work. They give previously institutional people another chance in life and that is very encouraging. As I always say, people deserve a second chance. Thanks for sharing your story even as difficult it may seem but lives will definitely be changed by just reading this story. Blessings!! Thank you everyone for all the kind and inspiring words. Feel free to contact me to continue the conversation or if you have any pertinent connections or collaboration ideas. Email: sandris2@jhmi.edu. Facebook: Stan Andrisse. Instagram/Twitter: @standrisse. Visit my website to find out more about the program I started to help support college after incarceration. I will have more blogs coming soon. I hope you continue to follow and support. All the best, Stan. Dr. Andrisse, congrats to you for turning your life around!! What a wonderfully motivating and inspiring story. May God continue to bless you and your family. Great ! You are a Inspiring Guy. Keep it up !